I love custom bikes. In fact, I own quite a few myself. 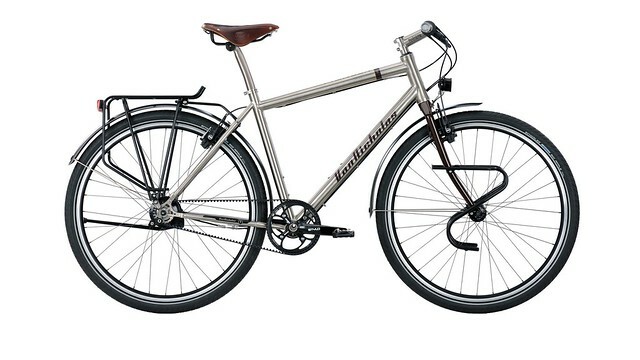 For diehard bike enthusiasts, there’s nothing in the world that compares to riding a bike tailored for you. 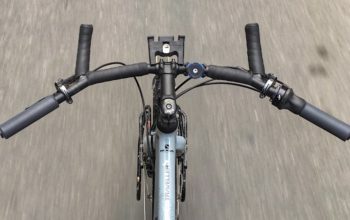 Handlebars: Drop (20), Flat (10). Brakes: Disc (16), Cantilever (10), Road (1), hydraulic rim (1), V-brake (2). 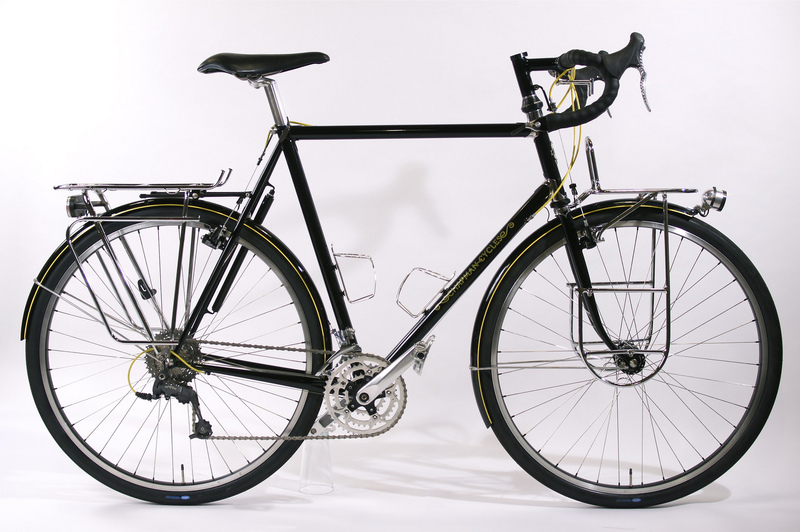 Mudguards: Metal (16), Plastic (7), None (6), Wooden (1). 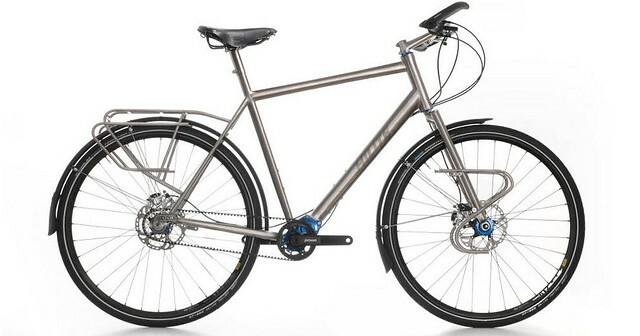 Frame Material: Titanium (14), Steel (12), Stainless Steel (4). Gears: Derailleur (17), Internally Geared Hub (10), Gearbox (3). Shifters: STI (7), Barend (5), Gripshift (12), Downtube (2), Trigger (2), Stem (1), Retroshift (1). Country of Origin: USA (19), Switzerland (5), Australia (3), The Netherlands (3). 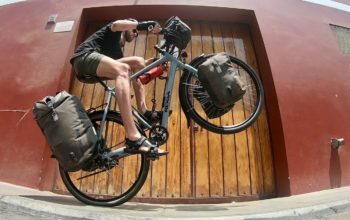 This Swiss company works with titanium to make unique touring bikes for purposes from light touring to expedition. I couldn’t pick one to show you, so I settled for three. 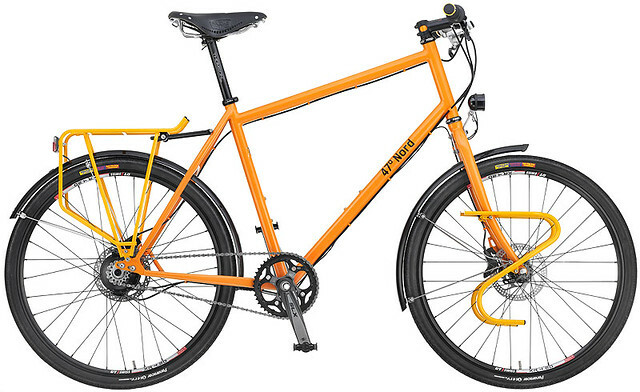 Many of their bikes use Rohloff 14s hubs, Pinion 18s gearboxes and Gates Carbon Drive. 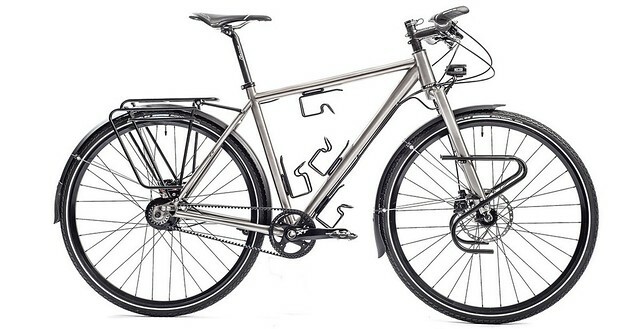 Integrated racks and seatposts, and matching stems finish the Hilite look. 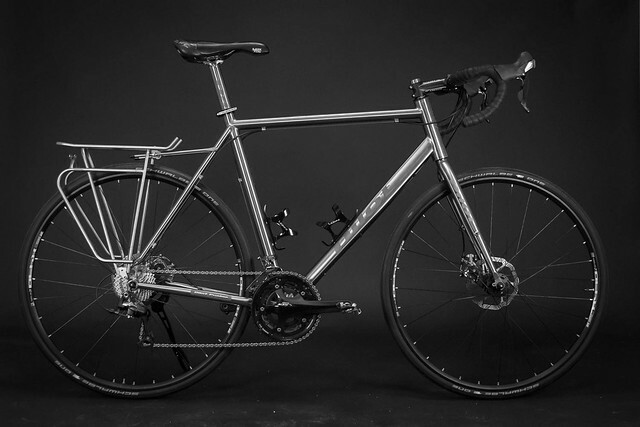 This Dutch builder has specialised in titanium over the years, putting together some mighty fine looking touring bikes. 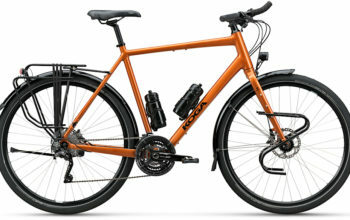 The Pioneer Rohloff 29er is unique compared to most touring bikes as it can squeeze in super wide 700c tyres. 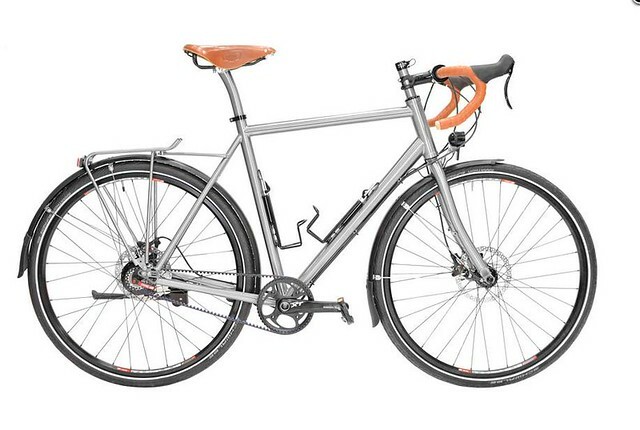 Van Nicholas come with all the top-end touring gear, including Gates Carbon Drive and a Rohloff 14 speed internal hub. 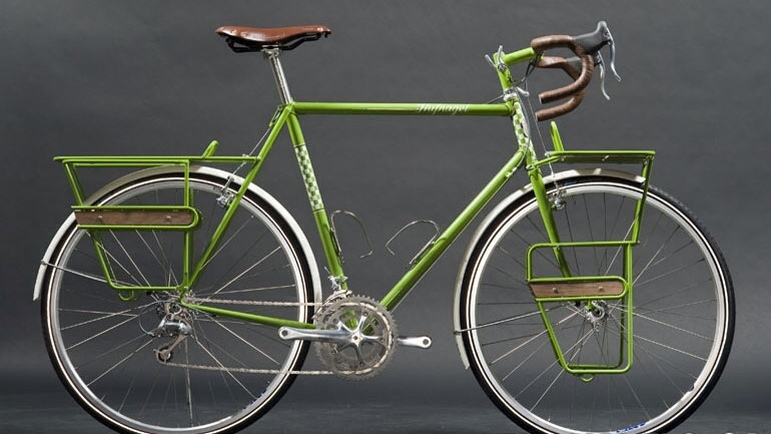 Matching stems, handlebars and seatposts complete the look. Breadwinner of Portland (USA) are Ira Ryan and Tony Pereira. 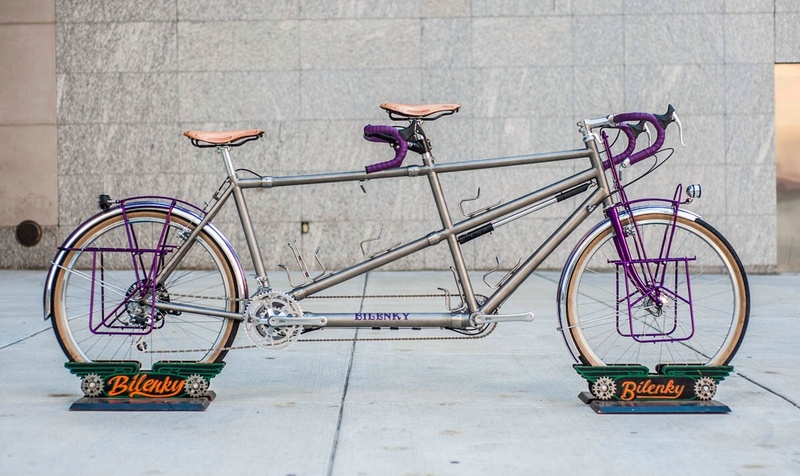 These two builders teamed up together “to get more beautiful bikes to more people who ride everyday”. 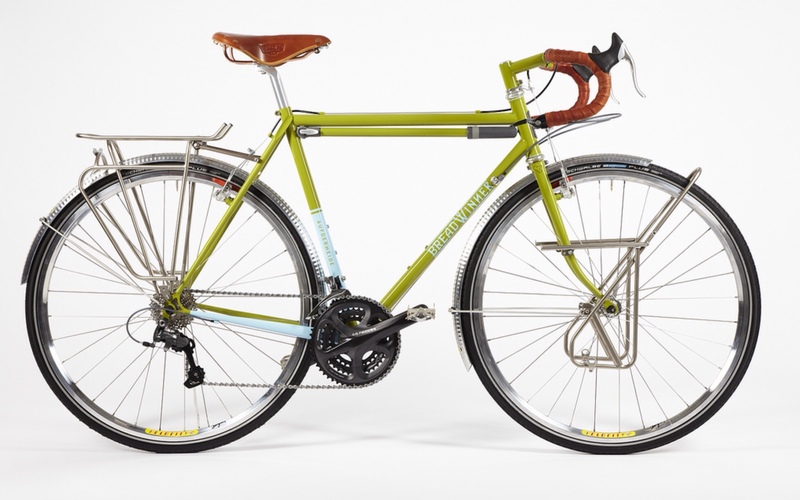 Although I’m not a huge fan of the green, the matching stem and pump look superb, and make sure to check out the headtube badge in Breadwinner’s website – it’s a work of art. The only thing I don’t agree at all with is the use of Shimano Ultegra crankset and derailleurs, they don’t sit well on such a classic bike. If it were mine, it’d be silver Campagnolo components instead. 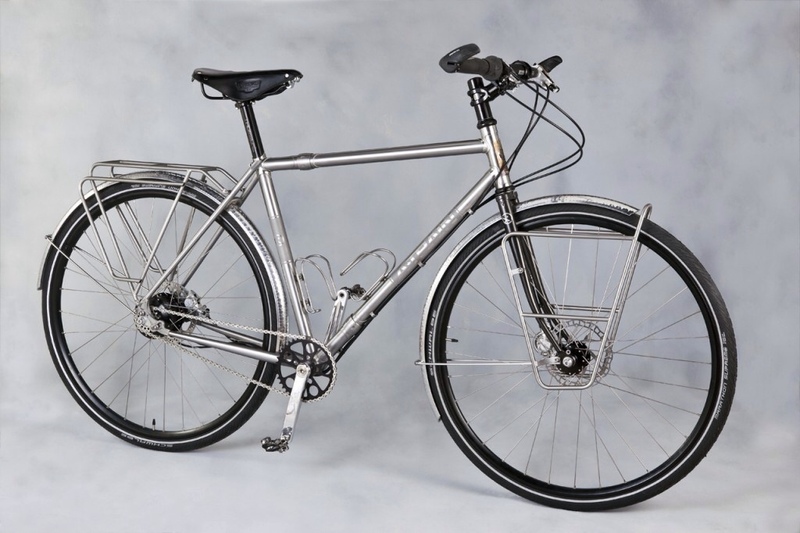 This stainless steel, fillet-brazed beauty is possibly the wackiest ride on this list, and is without doubt the most expensive. 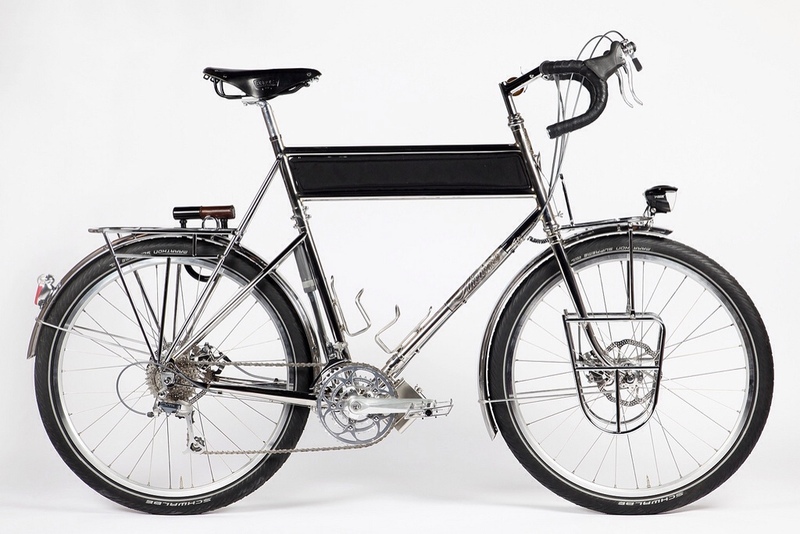 Somewhere between a work of art and a very capable tourer, it was built by Joseph Ahearne in Portland, taking six weeks to build, at 10-12 hours a day with no days off. The estimated value is $25,000 USD which is presumedly made up in labour costs. 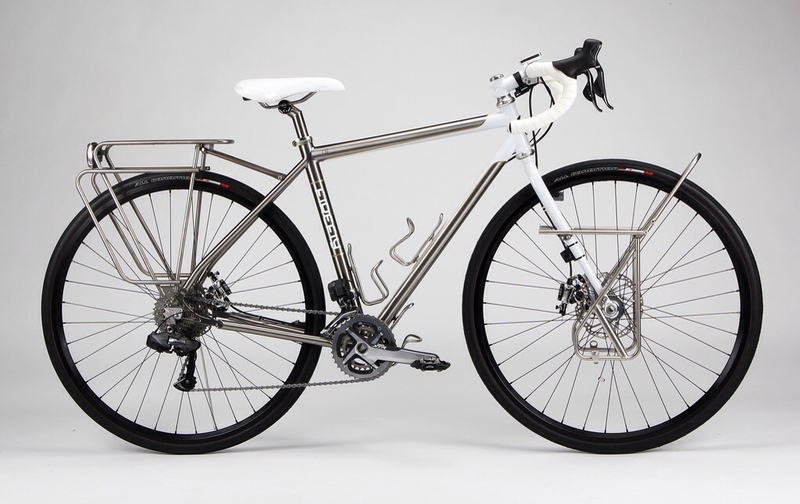 Interesting features include the high polish finish which exposes immaculate fillet brazing, KVA stainless steel tubing which is much thicker than any other option, Ritchey breakaway parts, additional support tubing for the seatstay/toptube, custom steel racks with a built-in lock holder, a flask holder on the downtube, a super retro Shimano derailleur and a logo panel made of stainless which has been laser cut and left unpolished on the downtube. This Ahearne Flickr album is a must-see to understand the level of detail and work that went into this amazing ride! 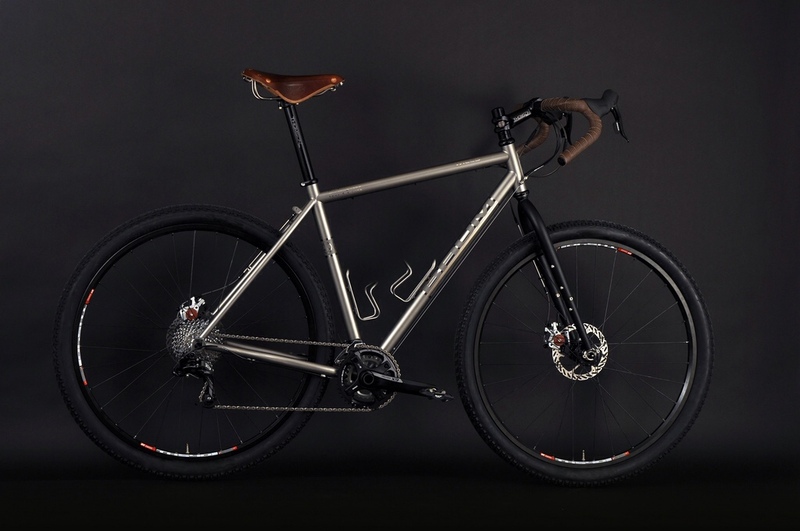 47 Degrees North of Switzerland build some stunning steel touring bikes with a very high attention to detail. 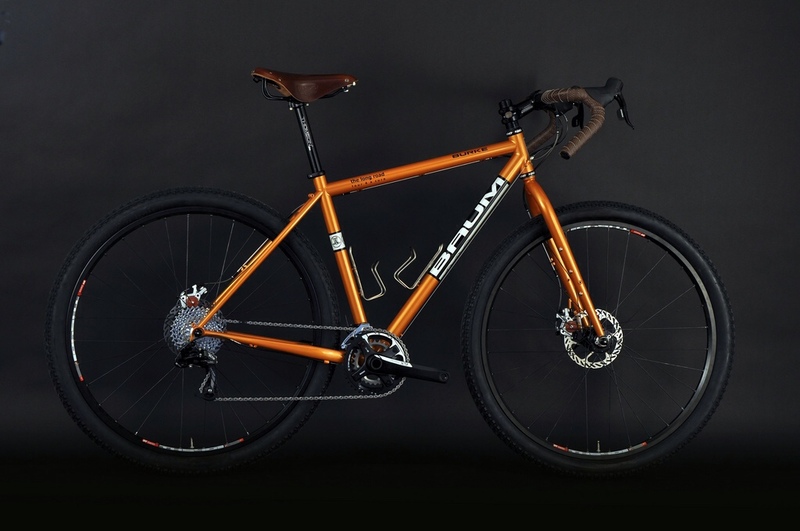 They select the finest touring wares (Pinion gearboxes, Rohloff hubs, Schmidt hubs, Tubus racks) to complete their builds, and then go about custom painting the parts so that no two bikes can be the same. Make sure to check out their ‘mixte’ ladies frames – they are beautiful. 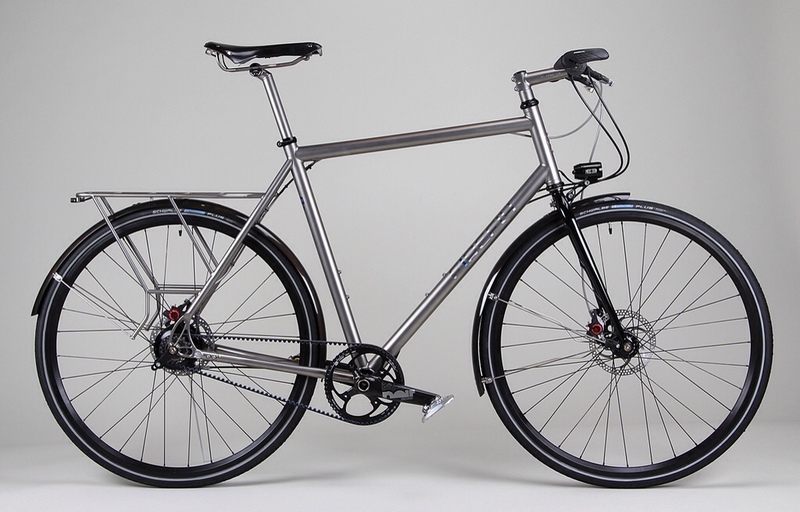 Firefly Bicycles of Boston (USA) make some of the nicest titanium and stainless steel bikes in the world. 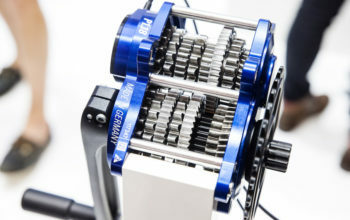 The upper bike is setup with Shimano electronic gearing which is normally only featured on road bikes, but has been fitted to work with MTB parts in this case. The lower two bikes have splits for Gates Carbon Drive which works seamlessly in combination with the Rohloff 14s hub – I love my belt drivetrain. The Firefly lettering is sometimes buffed up to a glossy finish on the downtube and can be chemically coated with anything from gold to a rainbow effect. 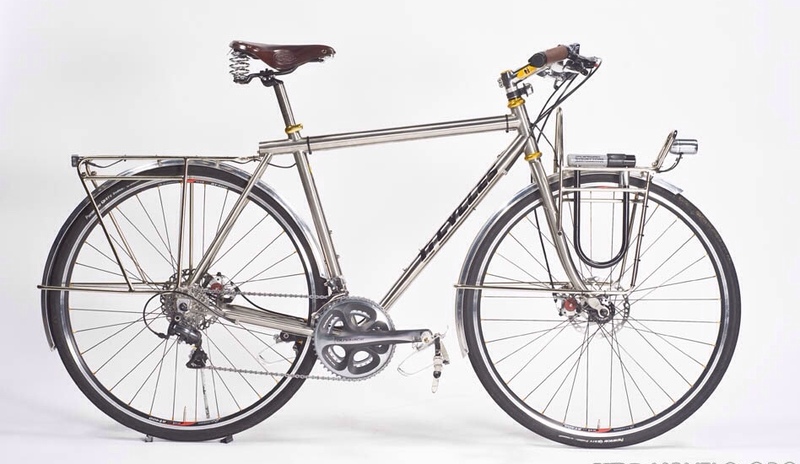 Other nice features include built-in rear racks, internal cabling, custom dynamo light mounts and stunning titanium stem and seatpost combos. 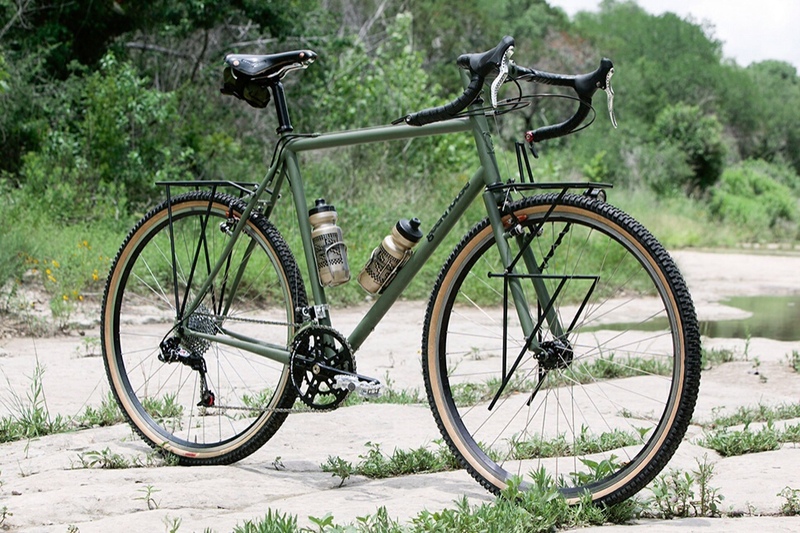 James Medeiros and Tyler Evans of Firefly have nailed these modern touring bikes. More @ Firefly’s Flickr. 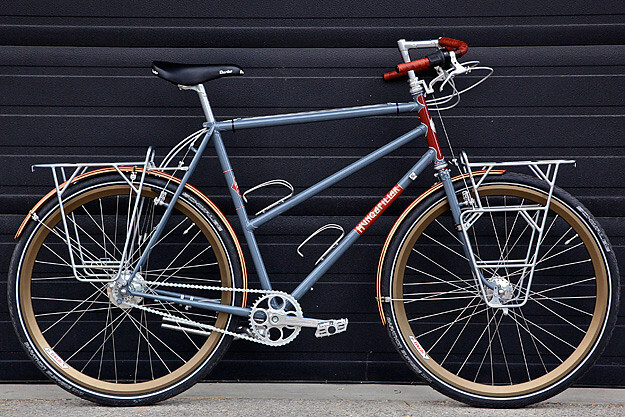 Tony Pereira, based in Portland (USA), has built this 650b bike up nice and classic. 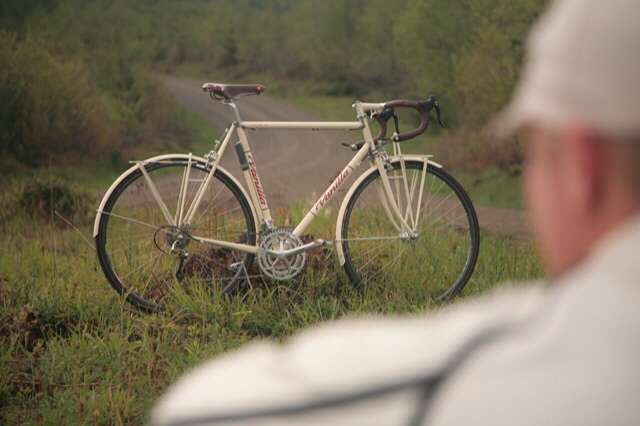 The high top tube, downtube shifters and birch finish give this bike a timeless look. A colour-matched stem, pump and Tubus cargo rack complete the build. 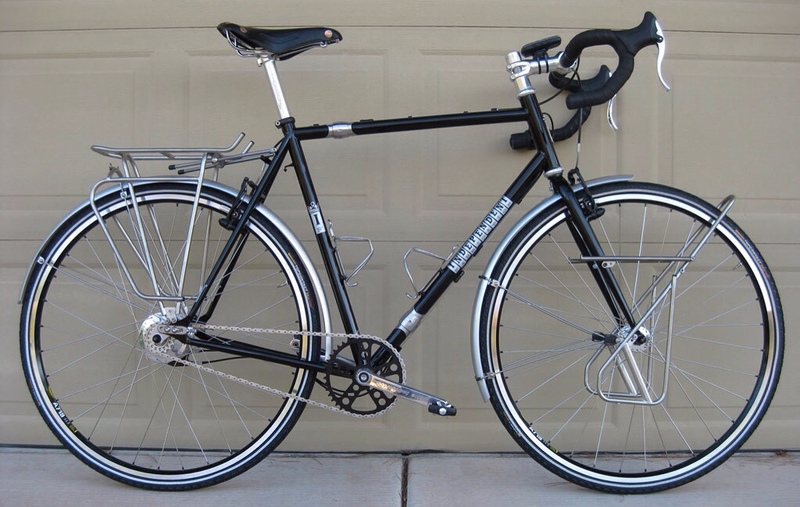 I can’t help but think the bike would look much better with some brown leather Brooks bartape to match the saddle. 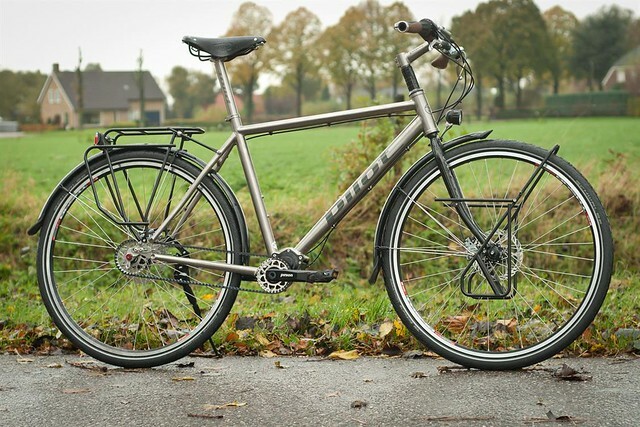 Pilot make their titanium bikes in the Netherlands; the finishing is top quality. On these bikes you’ll find Rohloff 14s hubs, Pinion 18s gearboxes and Gates Carbon Drivetrains. They’re certainly something to drool over. 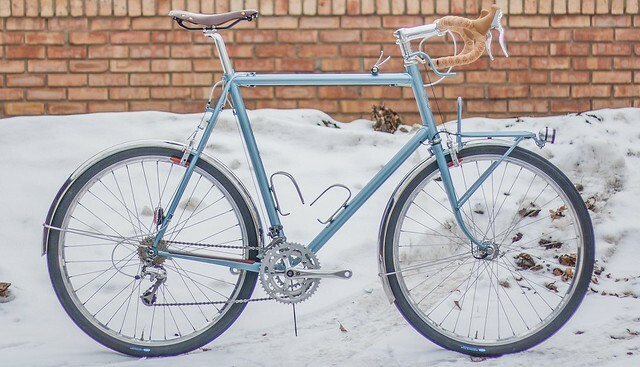 This custom Clockwork randonneur was too good to keep off the list. Apart from the stunning looks, there are lots of nice design details to be found including a custom mount for downtube shifters located on the top tube. 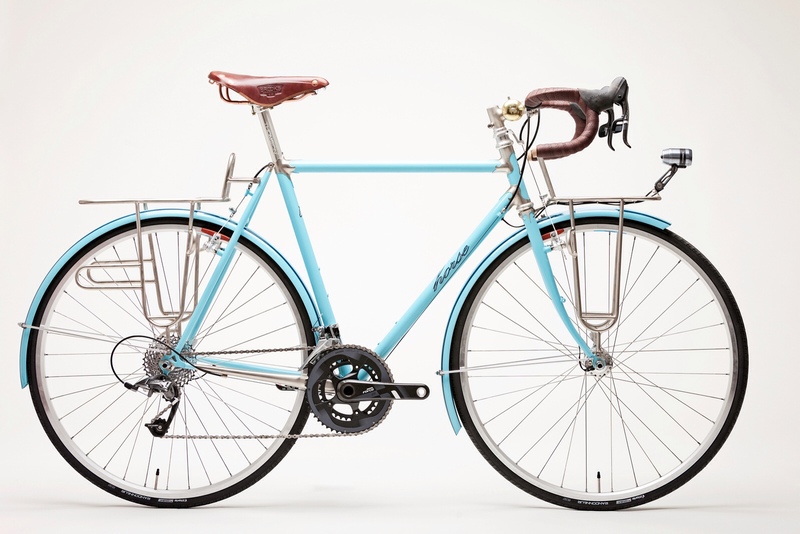 The matching painted rack and leather saddle complete the look. Keith Marshall from Canberra (Australia) is inspired by Japanese metalwork, but really, the Japanese should probably be inspired by him! 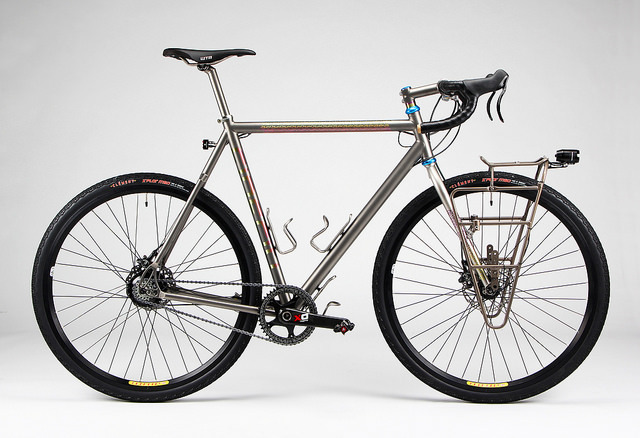 This stainless steel beauty is again a bit more on the randonneur side of things, but damn, look at it. It features S&S couplers to break the frame down nice and small, internal cable routing for the dynamo lights and beautiful Llewellyn lugs (these lugs are best in the business btw). More @ Kumo Cycles. 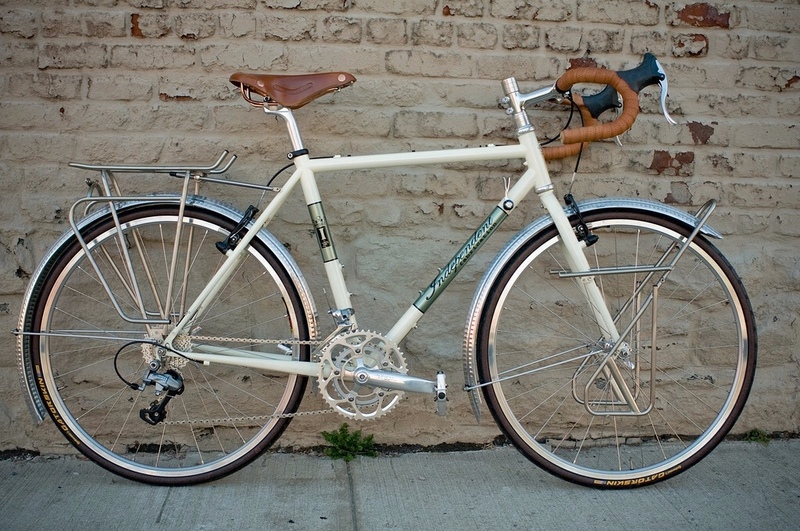 John from the Radavist takes photos of the nicest custom bikes in the world, but also has his fair share of sweet rides! I love the simplicity and colour of his Geekhouse, which is made by Marty Walsh and the team in Boston (USA). 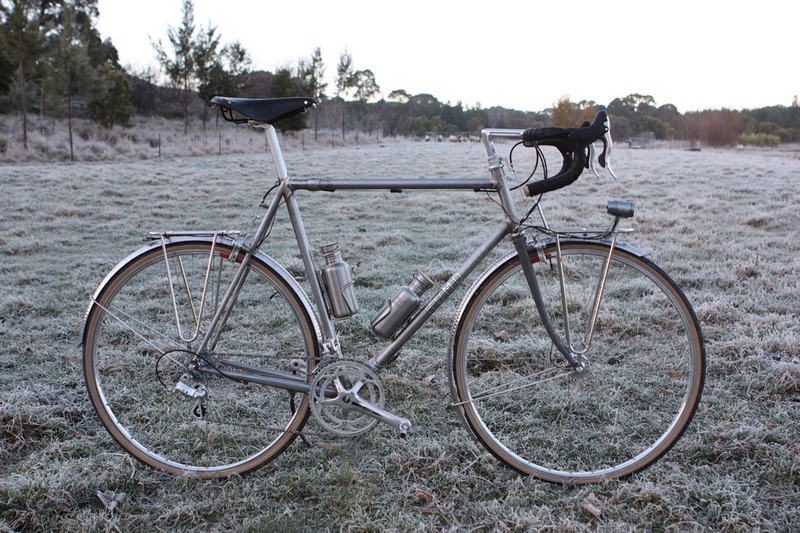 John has the colours and tones on this bike right down to the gold bidons – I love the custom racks too. 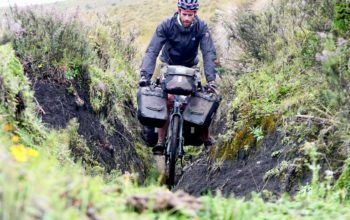 The bike employs a double 50-32 crankset and an 11-36t cassette which gives ample low-end gearing for the type of riding John does. More @ The Radavist. Sacha White of Vanilla Bicycles in Portland (USA) had so many pre-ordered frames to build that he no longer takes orders. That’s 5+ years worth, so I hope you’re not lusting for one too badly. 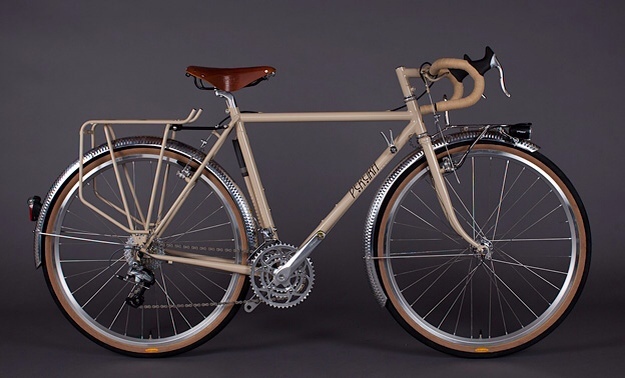 This Vanilla is more of a randonneur than a tourer, but given it’s impeccable finish it was too hard to keep it off my list. I particularly love the lugs and the colour matched guards/pump. The stem is a work of art too, check it out on the Vanilla website. 4. 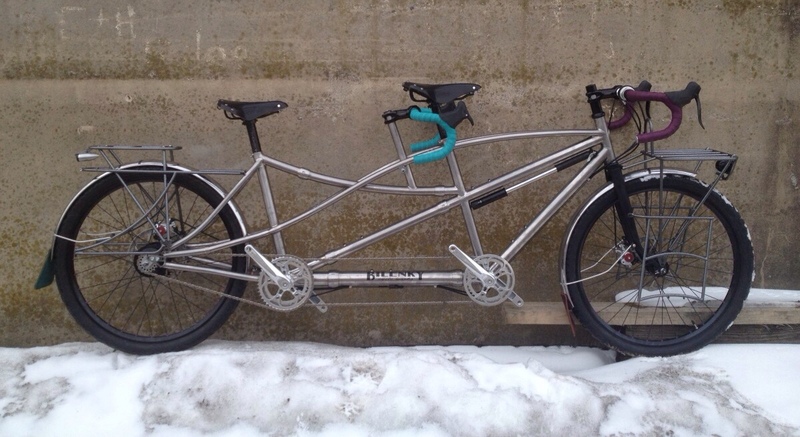 Use metal fenders. Polished or hammered metal fenders are all class. Who cares if they weigh more? 5. Paint your fenders the same colour as your frame. 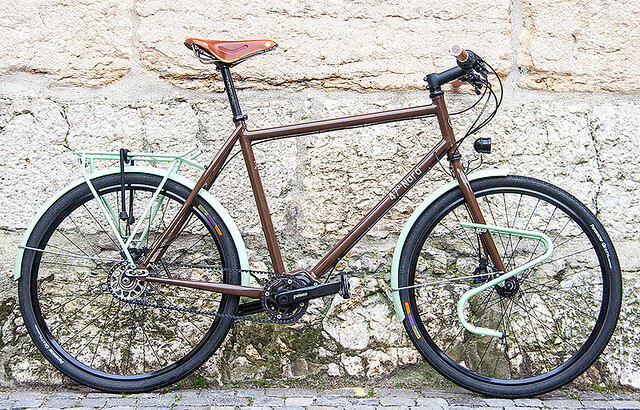 Colour-matched fenders are all class. 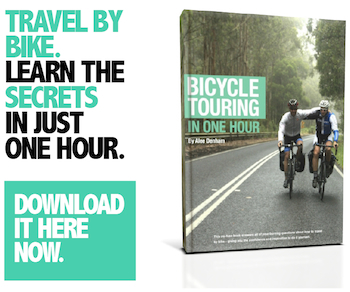 Do you know of any bikes that should be on this list? 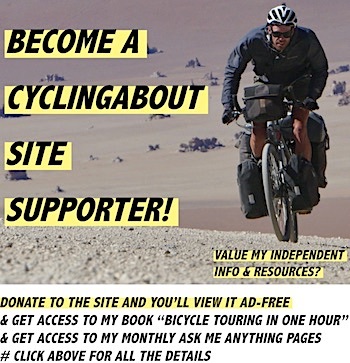 How Would I Custom Build A Round-The-World Touring Bike in 2019?